I am always interested in learning of different ways to represent data visually. Well here is something that will fascinate you if you are also interested in the many possibilites of displaying data. Visual-literacy.org have produced a fantastic “Period Table of Visualization Methods” (reduced version shown above). 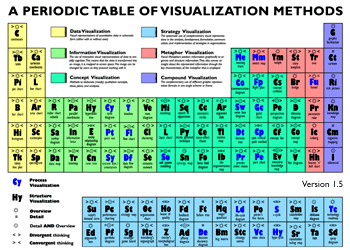 Being inspired from the standard chemistry period table, they have listed virtually every possible type of data visualization and categorised them. The only type missing I see is the “word cloud”.